Home Drinking Everything We Know About the “Lego”-Themed Pop-Up Bar Coming to L.A.
Everything We Know About the “Lego”-Themed Pop-Up Bar Coming to L.A.
An unauthorized Lego-themed bar may be headed to Los Angeles. News of the traveling pop-up, which plans to mix alcoholic drinks with small, sharp choking hazards, comes to us via Broadsheet Melbourne, which broke the news. “It’s nostalgic and this bar is designed to bring out the kid in all of us,” Demi Montgomer, the bar’s creative director, told Broadsheet. The plan for Brick Bars, as the project is known, is to construct a life-size bar out of one million plastic bricks, and then have additional blocks available for open play while guests enjoy their drinks—essentially, it’s exactly like the life-size gingerbread house bars that proliferated around L.A. over the holidays, but without the delightful fragrance or gumdrop accouterments. No official word has been released on just when or where this pop-up might arrive in Los Angeles, but Eater Montreal reports that the bar’s website stated that, after an initial run in several Australian cities, Brick Bars plans to go on tour, including the U.K., Canada, New York, and L.A. That text has subsequently been removed from the website and, when Los Angeles reached out to multiple parties associated with the project, none provided comment. Viral Ventures’ director, James Farrell, is a social media professional who once hosted what he claims was the largest yoga class in Australian history. He is not, evidently, much of an expert in matters of intellectual property. Which brings us to Brick Bars or, as it was initially titled, Lego Bar. 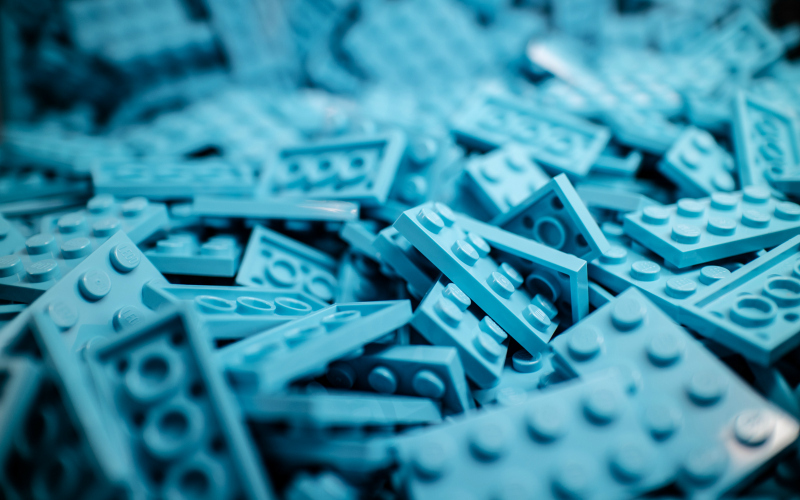 Lego is a trademark of the Danish company Lego Group, founded in 1934. The name is a play on the Danish phrase “leg godt” meaning “play well” but is, incidentally, also Latin for “I put together,” though that fact was not known to master carpenter Ole Kirk Kristiansen or his son, Godtfred Kirk Christiansen, when they launched the toy company in the town of Billund. In 1949, the company, having withstood Nazi occupation of Denmark, released their first version of the iconic studded “building brick” we all know and love. Throughout their history, the company has pretty much maintained the image of a wholesome toy company selling blocks to children, and children are not the primary audience for cocktail bars. Also, Lego is pretty aggressive about enforcing its trademarks. In response, the pop-up organizers renamed their project Brick Bars (which is still awfully similar to Bricks Beach Bar, an actual place at Legoland in Florida, but sure) and reiterated that, while in no way officially sanctioned by the Lego company, they nonetheless intend to move forward. Operating as an unauthorized or “tribute” theme bar puts Brick Bars in the company of plenty of pop-culture inspired projects that have come through L.A. in recent years, including the Tim Burton-themed Beetle House, Star Wars-ish Dark Side Tavern, and even Barkowski (yes, real), all of which have set a template for carefully skirting trademark issues. While we wait for confirmation that Brick Bars is heading stateside, we’ll have to fulfill our desire for nostalgia-steeped boozing with Saved by The Max, the Saved by the Bell bar and diner, which is finally set to open very soon in West Hollywood.